Recharge, recuperate: This is the bumper offer—lose your cellphone to find yourself again? Something fairly catastrophic happened to me last week: I threw my cellphone into the bath water. I didn’t intend to. I was gesticulating at my kids to “stop yelling" since I was in the midst of an important call. 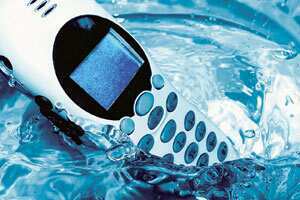 The next thing I knew, my cellphone flew across the room and fell into a bucket of bath water. Needless to say, I was panic-stricken and heartbroken. Even though I am of the generation that remembers a time without cellphones, I regard mine as indispensable; more important than my wallet, house keys or credit card. It is the one accessory I carry. Always. What if someone important was trying to reach me as I went downstairs to get milk at 6am? And now I had thrown my baby into the bath water. I felt like a foetus without an umbilical cord: bereft, at a loss. Often I would reach into my purse for the phone; it was like an amputee’s phantom limb. It itched, ached and occasionally, I could even feel it move. Day 1 was a disaster. I spent the whole day compensating for my mobile’s absence. I called all my friends, acquaintances and even people I cordially disliked to let them know that I was sans cell for a few days. One asked for my landline number. I couldn’t even remember it. “It is stored in my cellphone under ‘home’," I said stupidly. By Day 3, I was stoic. So, nobody could reach me at all times? So, the school wouldn’t be able to let me know if my kid fell sick or got hurt? So, my editors couldn’t call me and revile me whenever they felt like it? So, I couldn’t call home to check on crucial household matters such as whether there were enough tomatoes in the refrigerator? Well, it wasn’t the end of the world. I would just have to deal with it. By Day 5, a weird thing happened. I discovered that I had time; loads of it. As I waited—for groceries to be bagged; for the light to change; for the flight to take off—I found that I could no longer reach for the phone to make ‘productive’ use of the wait-time by talking to someone. Instead, I actually started noticing the world around me. Here is what I saw. I saw for the first time (even though I have lived in my neighbourhood for months) that a brown cow sat at the same spot beside the median, causing traffic on our road to hilariously screech to a halt before curving wildly around the cow. I noticed that my neighbour had cute eyes and curly hair. I noticed the inordinate number of people who were on their mobiles all the time: On the street, at malls, at the airport, on motorbikes, wherever I went, people were talking and talking, sometimes stupidly to thin air. I also realized that a cellphone’s ring was more insistent than a live person’s presence. At parties, people would break off in the middle of an animated conversation to check their phone whenever it beeped or vibrated. I also realized that even though cellphones come with an on-off button, people rarely, if ever, turned it off. I noticed people checking their mobiles in the middle of a superlative music concert. I also realized that many of the seemingly pressing reasons why people phoned me were not so pressing after all. Problems that seemed crucial would recede into insignificance simply by virtue of the fact that people couldn’t reach me. I began receiving emails like, “Hey, tried calling you to get Ria’s number but found it in my Palm Pilot after all." By Day 7, I was actually enjoying my cellphone’s absence. One night, I sat on my terrace with a glass of wine and stared at the moon. I couldn’t remember the last time I had done that. When my kids came home from school, the cellphone wasn’t a constant interruption when they told me about their day or asked a question. I found that my mind became a fertile plain with ideas and random thoughts (most of them useless, I admit) bubbling through. For instance: devising a chip for spectacles that beeped when they were misplaced; or the relative merits of gorgonzola and provolone cheeses; or more morbidly: Why did all the corpses look serene even when they died in horrific circumstances? If a person died screaming, shouldn’t the corpse look like Edvard Munch’s painting The Scream? Yesterday, the phone company called and told me that since my phone was still under warranty, they would replace it in a couple of days. I had half a mind to refuse but of course I didn’t. Life sans cellphone for a week is a honeymoon. But a cellphone was as necessary as…marriage? Nah. Toothpaste, maybe. I have a new cellphone. It has been a few days and I have to say that I am happy to have it. It is a comforting accessory; my connection with the great big world. But every now and then, as I walk past a bucket of water, I am tempted to quietly drop the instrument. If nothing else, I am determined to turn it off at least once a day.